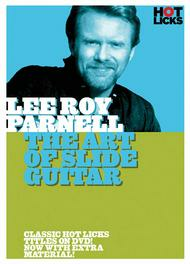 Top country artist Lee Roy Parnell is a slide guitar player of the highest order! Here he delivers in-depth examples of both acoustic and electric slide playing. Using E & G tunings and covering both blues and country, Lee Roy deals with scales for slide, emulating blues harp, vibrato and slide control, glass versus metal, and using a capo. It's a real professional's treasure trove of tricks, tips, and techniques brought to you by a star player.